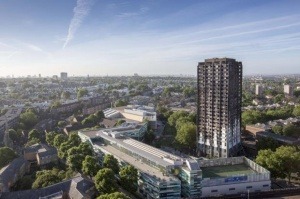 The fire at the Grenfell Tower in London. A poor choice of building materials? We have all been impressed to see the rapid spread of the flames through the facade of this 24-story building, the Grenfell Tower in London. It seems to be, according to the first investigations, that the cause of this fast spread of the flames could be due by a reform that was made of the building in 2011. In this reform the building envelope was changed to give a better appearance and also to obtain a better thermal isolation. For this purpose aluminum sandwich panels with Polyurethane were used inside. This type of material behaves relatively well in front of the fire until a temperature of 200-300 ºC, but from that point on, the aluminum foil exposed to the fire takes off leaving the Polyurethane already exposed to the flames and the propagation of the fire by a highly combustible plastic material. Why did they use Polyurethane? Polyurethane has the advantages of having an excellent coefficient of thermal conductivity and an interesting economic cost, but the fundamental drawback is its reaction to fire. Encapsulated in an aluminum sandwich or steel plate, it improves its behavior, but only up to temperatures of 200-300 ° C, which are reached relatively early in a fire. There are other types of cores for these sandwich panels such as rock wool or fiberglass that have a better behavior against fire and also do not carry out the work of propagating the fire, although they have a higher economic cost. On the other hand we have the the sectorisation between plants on curtain wall facades. The DB-SI in Spain requires a length of one meter in vertical projection that maintains the Thermal Insulation and the Integrity during 60 minutes to avoid the fire to be propagated outside in vertical, but in this particular case, although If it was done correctly, which we do not know, it would have been inefficient due to its building envelope made of combustible material. Another issue also to be debated is to demand by means of mandatory automatic sprinklers in this type of high-rise buildings intended for residential use. It is clear that the potential risk of this type of accident would be reduced, as well as the revision of protected stairs that allow the correct evacuation of the building.